Okay you need to calm down. That’s a lot of exclamation points for something you are not going to be allowed to eat. That’s so unfair! It smells like the Best. Cat food. Ever. I’m sure you would like it. But it’s for me. 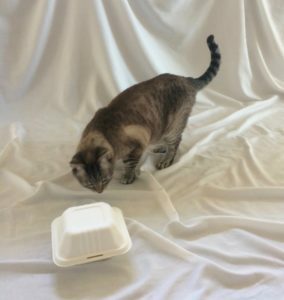 But I’ll let you lick out the takeout box when I’ve emptied it. Poppy says she has the contract for licking out food boxes. What she doesn’t know won’t hurt her. Wow, Mia! It sounds like you’ve got a pretty good secret deal going there!